Maintain Accurate and Repeatable Measurements. For 2D verifiers, you can choose a â€œ2D Calibration Cardâ€ or a â€œLinear Calibration Cardâ€. Either of them will allow you to calibrate the reflectance levels which is what calibration does. 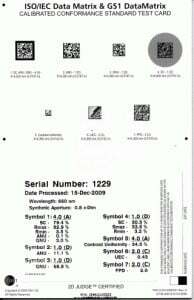 However, only with the GS-1 Data Matrix calibration card contains Data Matrix symbols with intentional imperfections that you can measure with the verifier to check the reporting capabilities of the verifier.